Ronstadt Generations y los Tucsonenses perform on Friday, Jan. 6, at the Sebastopol HopMonk (230 Petaluma Ave.) and Saturday, Jan. 7, at the Novato HopMonk (224 Vintage Way). 8pm. $15. hopmonk.com. BLUE BY YOU Making music is in the Ronstadts’ DNA. The Ronstadt clan traces their roots in Tucson back five generations, and each one of them has been a musical family. Everyone of a certain generation knows the name Linda Ronstadt, but she's not the only singer and songwriter carrying on the family tradition. Formed in 2009 by Linda's brother, Michael J., and now fronted by his sons Michael G. and Petie, Ronstadt Generations blend almost 200 years of Southwestern musical folk heritage to create a lush, sun-drenched and multi-genre repertoire. The band performs twice in the North Bay this week, hitting up the HopMonk taverns in Sebastopol and Novato on Jan. 6 and 7 respectively. Only 13 months apart, Michael G. and Petie grew up with music ingrained in family activities and gatherings, though they also got to see the professional side of that life early on. "When we were young, my aunt [Linda] was doing mariachi records," Petie says, "and my dad was singing with her, so we got to travel to studios and be a part of that. Looking back on it, it was impactful in how we came up as musicians—it really left a big imprint on my life." The brothers formally got into music through school bands. Michael G. chose the cello, "because he could sit down to play it," jokes Petie. "And he's taken the cello to other levels. In my opinion, he plays the cello like no one else. He's a great improvisational player, a great folk player and a great classical player." Petie started on violin before moving to upright bass and guitar. "I just try to expand my musical library of instruments," he says, noting that he also dabbles with the banjo and tuba. "Whatever palette of colors we can paint with," he says, "the broader the palette makes for a more interesting band." 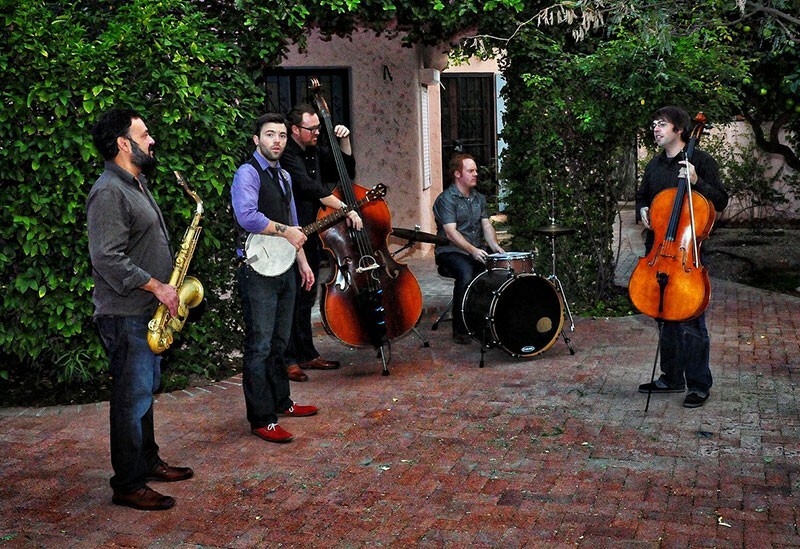 After a few years of playing as a trio on the road, Michael J. and sons evolved the band into a six-piece ensemble by recruiting fellow Tucson musicians Alex Flores (tenor sax and vocals), Sam Eagon (upright and electric bass) and Aaron Emery (drums and percussion), and expanding the band's moniker to Ronstadt Generations y los Tucsonenses. Michael J. Ronstadt died last year, but his sons are committed to keeping the family tradition going. "We all put a lot of heart into it," Petie says. "I think he would want to see it live on."